The National Parks and Wildlife Service isn’t usually included in lists of Irish navigation authorities, but it does regulate boating on the Lakes of Killarney. Only lake boats are allowed, no engines of more than 5hp, mooring disc must be displayed. And there is a waiting list for moorings. 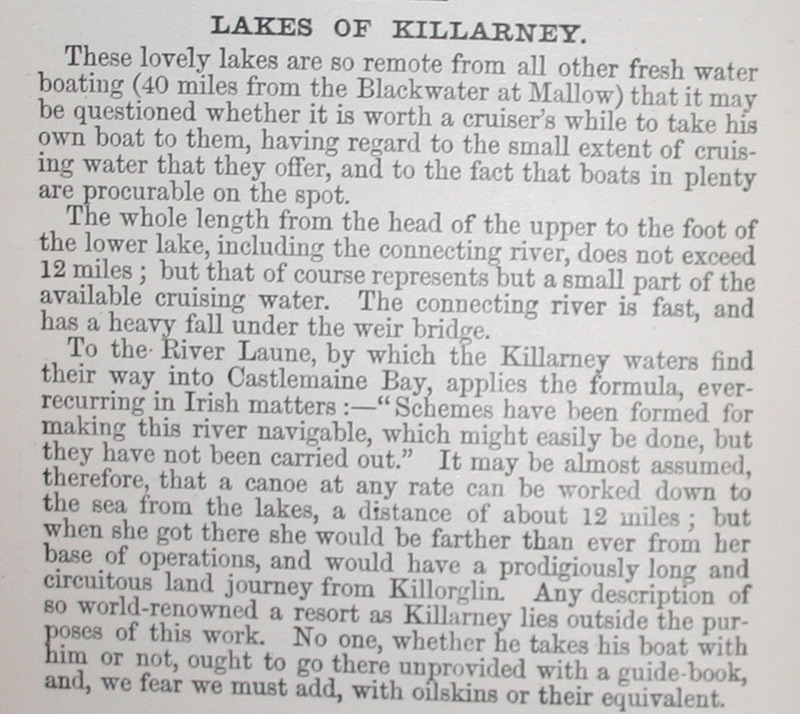 Life was simpler when F E Prothero wrote about the lakes of Killarney in A New Oarsman’s Guide to the Rivers and Canals of Great Britain and Ireland, edited by himself and W A Clark and published by George Philip and Son, London, in 1896, as a Cruising Club Manual. Here is what he said. Nowadays, of course, the best reason for visiting Killarney is to buy from the German Butcher Shop.